- Publisher Start with Me is part of start>Becoming a Good Samaritan, a nationwide church and small group experience that features an impressive list of national and international supporters---including host and award-winning author John Ortberg, Eugene Peterson, Philip Yancey, Matthew Sleeth, Jim Cymbala, Chuck Colson, Archbishop Desmond Tutu, Brenda Salter McNeil, Kay Warren, Joni Eareckson Tada, Rob Bell, Shane Claiborne, and many others. In Start with Me, a group of fictional friends in Santa Fe, New Mexico are leading normal, safe, Christian lives. Independently, each of them has begun to wonder, 'Isn't there more?' As their stories unfold, you will begin to experience what it looks like to step out in faith and act upon Jesus' command to 'love our neighbors' in a hurting world. Like the characters in the book your life will be transformed as you search for your own starting point and ask God to direct your path to the person that needs your help, your healing touch, your prayers... your neighborly love! 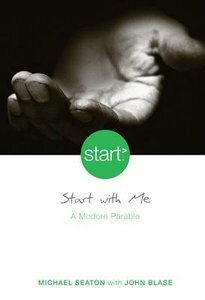 Start with Me is part of start>Becoming a Good Samaritan, a nationwide church and small group experience that features an impressive list of national and international supporters---including host and award-winning author John Ortberg, Eugene Peterson, Philip Yancey, Matthew Sleeth, Jim Cymbala, Chuck Colson, Archbishop Desmond Tutu, Brenda Salter McNeil, Kay Warren, Joni Eareckson Tada, Rob Bell, Shane Claiborne, and many others. In Start with Me, a group of fictional friends in Santa Fe, New Mexico are leading normal, safe, Christian lives. Independently, each of them has begun to wonder, 'Isn't there more?' As their stories unfold, you will begin to experience what it looks like to step out in faith and act upon Jesus' command to 'love our neighbors' in a hurting world. Like the characters in the book your life will be transformed as you search for your own starting point and ask God to direct your path to the person that needs your help, your healing touch, your prayers... your neighborly love! Meg Prowting and Penny Fuller both work as Children and Youth Development Officers for the Methodist Church. Mike Seaton is Director of Children and Youth at the Methodist Church.